A manager can use team meetings to solve problems, build good working relationships and review how the team is progressing against objectives. Involve the whole team in planning its development for the future and help staff to realise how much they can learn from one another. By creating an open and honest environment, a manager can encourage staff to share information and knowledge, thereby building support and trust. After all, peers are often the best advisers to their colleagues. Call the team together for a combined appraisal on how well they work together. Focus team members on the objectives they should be looking to achieve as a unit. Concentrate on discussing items that are of interest to the whole group. Postpone issues that involve one or two people and not the whole group to a separate meeting. Negotiate the agenda for the meeting and be prepared to drop items in favour of better suggestions from team members. Establish what team members’ roles are. Ask team members to note down any actions they are responsible for. Get each team member to summarise their own action plans in order to check their understanding and commitment. 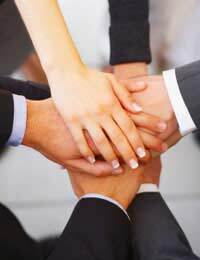 A manager should praise team efforts in order to show that teamwork is valued. Ensure each member of the team is clear about the team’s objectives and how these are linked to the other teams within the company. When training staff, try to group employees with similar development needs together. This will not only make training courses more economical, it will also encourage teamwork, as staff can share learning experiences. By sharing resources to get the most from a training budget, a manager can help to secure the future development of their team. Keep a record for senior management of who has attended courses, the subjects covered and the benefits. This will allow management to evaluate their investment in training and development. If convinced by the business case for developing their staff, management will continue to invest. Future development plans are more likely to be approved if they build on past successes. Teambuilding events will allow staff some time away from the workplace to learn how to work better as a team. If a manager wants to reassess their team’s goals and direction, improve communication or give the team an energy boost, a teambuilding event can help achieve this through discussion, brain storming, game play, role play and goals setting. Calling on professionals to improve teamwork can be expensive, but if successful the resultant boost in morale, motivation, confidence and effectiveness of the team and its individual members can transfer to the workplace and boost production. A fresh perspective and new ideas can help teams sort out problems and plan for the future. Teambuilding events can provide the ideal setting to look at a team’s purpose, vision and mission and teamwork will improve as team members learn more about each other.